This is a strange one, I’m currently writing this post on the balcony of our hotel in Madeira, and yes, it’s warm, so yes, you’re jealous. Another strange thing about this post is that my album of the month isn’t actually my album of the month. Officially, my favourite record that February produced is Sampha’s ‘Process’. BUT I already did quite a lengthy review on that record here. Therefore I’m gonna give another album it’s time in the limelight. But first a little look at February as a whole. Big Sean’s ‘I Decided’ was the first album I heard from February and I can’t lie, I was pretty disappointed. I’m not a huge Big Sean fan anyway, he definitely has his tracks especially from some of his earlier projects and his last effort ‘Dark Sky Paradise’ had some really promising songs hidden amongst the filler tracks. Regardless I tried to go into this album with an open mind and after sitting through the full thing, I can’t help but feel like Big Sean still hasn’t quite found his sound, or feet in the rap industry. He doesn’t bring anything new to the table here apart from a quite loose attempt at a concept album. On a lighter note, the first album I really enjoyed from February was HOMESHAKE’S ‘Fresh Air’. This record is a gorgeous blend of Synthpop and R&B executed brilliantly. The atmosphere on this project is really something unique. You get lured in with the slick R&B beats and melodic vocal hooks but then some unnerving keys will sneak into the mix to make you question how comfortable you really are. Check the track “Khmlwugh” for a great example. Syd, of The Internet fame released her debut solo album ‘Fin’. This was a close contender for my AOTM but just got pipped at the post. This is a luscious R&B album with very obvious hip hop/ trap influence. Bumped this a lot this month and if you like The Internet’s material as a band, I’ve no doubt you’ll enjoy this record. Jesca Hoop really surprised me this month with the release of ‘Memories Are Now’. The vocals draw comparison to Joanna Newsom and Bjork, particularly on the album opener. This is one of my favourite indie folk albums to drop this year and surprisingly this is my first taste of Jesca Hoop’s music! The instrumentation is great the strings sound gorgeous and really compliment her voice, a really solid release this early on in the year. Animal Collective released an EP as a kind of counterpart from their latest full length, Painting With. The Painters EP just kind of carried on from where Painting With left off. Animal Collective aren’t the easiest band to get into so if you’re looking to, I definitely wouldn’t start here. Slightly more reined in from the full length but really not by much. Four tracks, short and very weirdly sweet. Future gave us his self titled album, the first of two albums that he would release this month. This wasn’t my favourite of the two but I still thought it was a pretty enjoyable listen. Future’s mumbled vocal style and trap beats tend to get a bit samey after a while. Definitely still a great addition to the ever growing Future discography. Jens Lekman released ‘Life Will See You Now” which was my first exposure to his music, and I loved it. This is a really great indie pop record with creatively, but familiar, crafted songs. It doesn’t take many listens for this album to sound good which was a pleasant surprise. Great lyrics and very easy to listen to. Ryan Adams released his sixteenth (!!) studio album, Prisoner. A break up album delivered in Ryan’s developed indie country style. The lyrics are obviously very personal on the album topic but as a fan of Ryan Adam’s, the instrumentation is just a bit same old. He has his sound and he does it very well but he’s certainly staying in his comfort zone with this release. Finally, on what was probably the strongest stand-alone day in February, Mark Kozelek’s – Sun Kil Moon released ‘Common As Light And Love Are Red Valleys Of Blood’. This album clocks in at an impressive two hours and ten minutes. Even being into Sun Kil Moon, this is WAY too long for an album in my opinion, especially with music as draining as Kozelek’s. Regardless, I found the time for it and it is enjoyable. Kozelek is one of my favourite songwriters and he doesn’t let us down again with this release. Very creative folk music. We saw Future embrace his emotional side on his HNDRXX release. I really enjoyed this album and preferred it to the self titled no question. With a modest two features from The Weeknd and Rihanna breaking up the album a bit. King Gizzard And The Lizard Wizard released the first of their FIVE albums they intend to release this year. Flying Microtonal Banana might be the dumbest album name on the list, but don’t write it off. This is a very experimental psychedelic album (no massive surprise). This is a solid release and the forty minutes seemed to fly. The guitar work is fantastic and I hope the quality doesn’t dip on the next four! UK Grime artist Stormzy put out his debut ‘Gang Signs & Prayer’ which I was quite surprised with. I don’t mind a bit of Grime but I really enjoyed this record. I was caught a bit off guard with some of the gospel and soul influences on this, something not usual associated with the Grime genre. But still for a debut album, it’s nothing groundbreaking, but if you enjoy Grime you’ll find something for you on this project. Finally my album of the month..
Thundercat’s Drunk was only released on the 24th Feb, and I’ve hardly turned it off. On the first couple of listens it’s very warm and appears to be a great soundtrack leading the way into spring time. It’s only after a few more listens that I started noticing a bit more of a mysterious dark side to it. It’s a fun musical journey across the 23 tracks, some being interludes tying the longer tracks together. My one nitpick wth this album is the track Jericho, it’s just too short. Experimental funk, with jazz fusion and soul influences, there is just so much going on, but it’s produced to not be overwhelming. 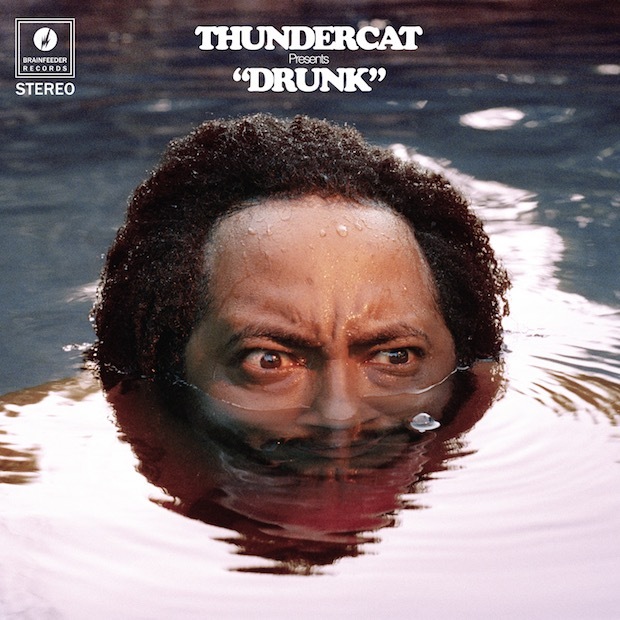 Thundercat doesn’t take himself too seriously which is great, the track Tokyo shows this perfectly. February has given us two of my favourite albums so far this year, being Sampha’s Process and Thundercat’s Drunk. I’m excited to see what the rest of the year will bring us.